EDGE welding cups offer a premium experience which harnessing cutting-edge technology for precise results time and time again. The whole range of diffusers, welding cups and other attachments have been scientifically designed using superior materials to provide a performance like no other. Once you’ve tried EDGE you’ll appreciate the difference in quality, with improved visibility for TIG/GTAW welding projects. Long lasting and accurate, the precise scientific engineering delivers exceptional results each and every time. The industry is constantly evolving but EDGE welding cups are the very best available. 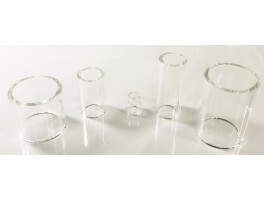 Using Pyrex glass creates a welding cup which can be produced in a wide variety of sizes, giving you the flexibility needed whatever project you’re working on. Welding is extremely demanding on the equipment but these have been designed to be able to comfortably withstand high temperatures. A high-quality finish and durable performance mean that this are the number one choice for welders. You’ll find a great selection of welding cups in different shapes and sizes including EDGE 15 and EDGE 18, recent releases onto the market. This means that whatever you’re working on, you’ll have a great choice of welding cups to choose from. However, if you’re looking for a specific size and you can’t see it in our online catalogue, we also offer a custom cup service. We can create a welding cup to match your exact specifications, guaranteeing you precise results and an exceptional performance. Just get in touch and let us know what you need and we will provide a quote for your bespoke design.